Advice on how to furnish your home in mountain style. Imagine coming home and immersing yourself in the warmth of a mountain living room. The fireplace is lit and there are noises coming from the kitchen where meals are being prepared. 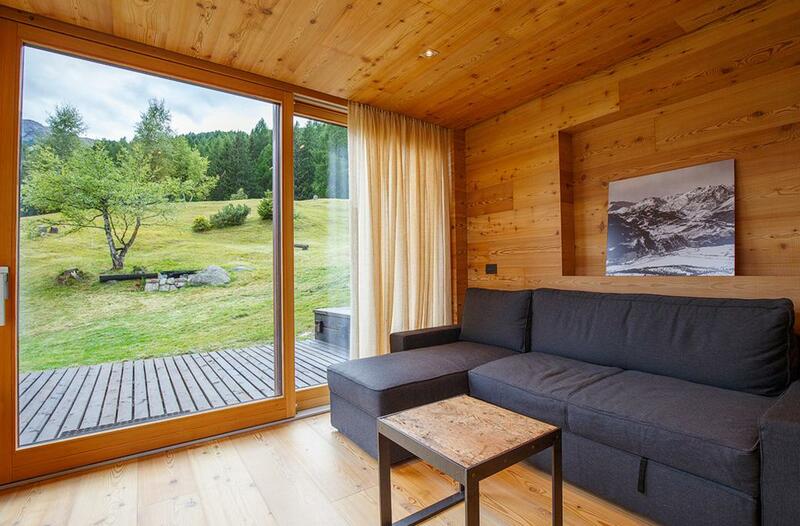 You stop to watch the calm landscape of the Alps of Valtellina from the window, whilst around you the wood gives warmth. Bottega del legno loves everything about mountains, and with our furnishings we want to give you the authentic experience of the relaxed and attentive way of life in which we grew up. Here's everything you need to know about perfect furnishings in mountain style. The living room is the social area. The main feature of this environment is the fireplace, the traditional hub of all household activities during winter, nowadays it is often replaced by a pellet or wood stove, which are easier to look after and require less maintenance. You can opt for a suspended fireplace in the center of the room if the original structure does not have one. Modern, traditional or technological: shapes change but not the function: the fire is the attraction that brings together people and their stories told all around it. In a chalet-style apartment the bedroom is the quintessential relaxation area. Nowhere else can you rest so well in a mountain home: some woods such as Swiss pine have features that facilitate relaxation and decrease the heart rate. If your mountain style home is a holiday home, it is important to have as many bedrooms in the least possible space to accommodate all the friends who want to come and visit. Below you can see a solution showing two convertible beds that during the day disappear to make room for household activities. Water, wood, stone and ceramics: these are the main materials that we use to build bathrooms in a mountain home. In our area the bathroom is the place for well-being, the place where you take care of yourself and the people you love. Imagine returning from a long skiing trip and finding a large bathtub of hot water awaiting you. In a mountain home there are also often smaller bathrooms built, windowless, which serve as service bathrooms for guests. Even the decorations will vary depending on the style you want to give your mountain apartment. We recommend keeping, as much as possible, the original elements of the structure: ceilings, exposed beams, wooden lofts, beading, stone niches and rough masonry. All these elements can be carefully combined with more linear and minimalist decor for a modern, welcoming look, or with rustic and ethnic ornaments for a traditional mountain chalet style. We would advise you to visit our styles page to get a better idea of all the choices available to you for decorating your house in the mountains. An excellent traditional wood is pine. It’s very light colour is easy to paint using positive colors (a special process that enables the wood to be painted whilst keeping exposed the grain and knots of the wood). Alternatively, for a more rustic result, you can use wood brushing: a technique that allows you to highlight the grain, making it even more natural and expressive. For a more contemporary style we recommend evaporated wood or reclaimed wood. Evaporated wood is actually the inner part of old beams, characterized with numerous cracks. If evaporated it assumes the typical colour of old wood, which is very characteristic and expressive. Old reclaimed wood is to all effects abandoned wood salvaged from old houses. Again in this case it is a very expressive wood, which is shown at its best in furniture in simple and minimal shapes and essential decorations. Swiss pine is the wood that we most like to work with. It is one of the most malleable of woods and easy to work with, for this reason it is used a lot for sculptures or decorations and traditional carvings. It allows you to create the most unusual shapes and its light and delicate colour reddens when exposed to sunlight. One of the techniques used to stabilize its hue is evaporation, which allows you to obtain a more homogeneous colouring. Its delicate essence makes it the best wood for traditional processes, along with spruce. If you are interested in receiving more advice for your custom made furniture: write to us! Together we can create an apartment in authentic mountain style.